Everyone knows that Lionel Messi is of course Barcelona’s key man, as he would be for any team in which he featured, but while he’ll expect to produce more than he did in the first leg, we’d prefer to highlight another veteran enjoying an impressive season in Barca colours. Gerard Pique got his first real break under Sir Alex Ferguson, but while he returned to his boyhood club to much success, he had a habit of occasionally switching off in his early years alongside the warrior that was Carlos Puyol. The centre-back is now 32-years-old and the elder statesman of the team in defence, putting in arguably his best performance of the season to date in the first leg. The Catalans aren’t the free-flowing passing carousel that they once were under Pep Guardiola and have a more pragmatic edge to them these days, and with Pique at the heart of their defensive efforts, it’s no surprise that he missed the explosive 4-4 draw with Villarreal recently. However, a clean sheet and Ernesto Valverde’s men are through, and Pique will be tasked with keeping things organized at the back. We spoke last week about how right-back is the area of Barcelona’s team that could be targeted. However, we were left somewhat disappointed that Anthony Martial started on the bench and instead full-back Diego Dalot (playing as a wing-back) was left to carry the forward threat down that flank. Although in fairness Dalot impressed going forwards, it would be a surprise if Ole Gunnar Solskjaer repeats the same cautious formation with a three-man defence, especially as Luke Shaw is suspended, while we’ll need to push for goals this time around. With an actual winger rather than a wing-back, starting higher up the pitch, there’s greater opportunity to get in behind as Barca’s full-backs bomb forwards. It was actually Jordi Alba on the left-hand side that struggled last week, and width to the attack should be crucial to our chances here. Ajax’s Frenkie De Jong has been signed for this summer as a long-term replacement for 30-year-old Sergio Busquets, while 31-year-old Ivan Rakitic is hardly the future either, nor 31-year-old Arturo Vidal. Meanwhile, Rafinha has a seemingly never ending list of injury problems to contend with, while Philippe Coutinho has looked lost when stationed deeper in Barcelona’s midfield rather than in attack. 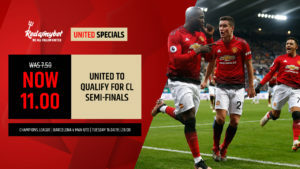 That may help explain why the Catalans weren’t so dominant in the centre last week, despite the lions’ share of possession, and the likes of Scott McTominay, Jesse Lingard and Paul Pogba should have the energy to unsettle some tired legs.